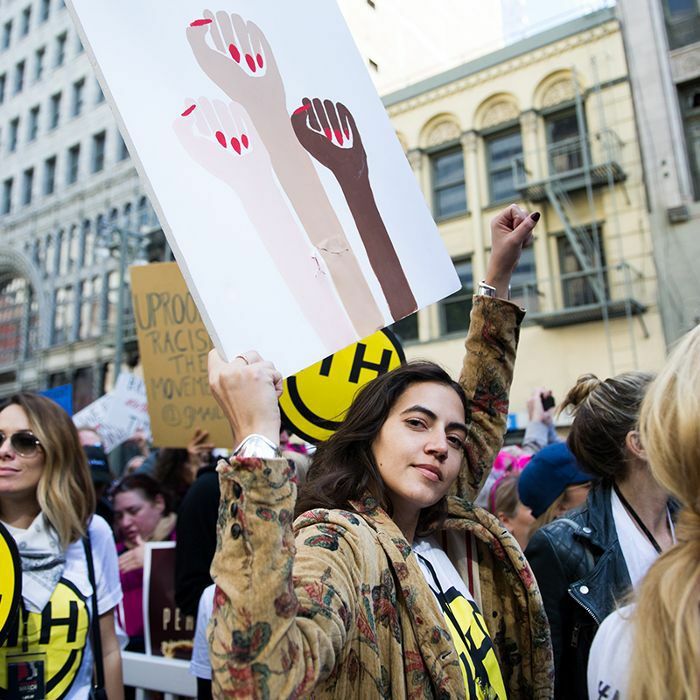 This time last year, millions of women and allies from more than 600 cities across the globe rallied together to march for women's rights and human rights following the election and inauguration of Donald Trump. The 2017 Women's March broke records and sent an echoing message of solidarity from cities near and far. Supporters will once again fill the streets this weekend (January 20 and 21) to walk in more 250 demonstrations planned worldwide, everywhere from Washington, D.C. and Los Angeles to Zambia and Thailand. It all starts in Las Vegas on January 21, where the organizers of the Women's March will hold a rally dubbed "Power to the Polls," with the goal of helping elect more women and progressive candidates into positions of power nationwide. Other major cities will be holding their own marches this weekend. Angelenos will gather at 8:30 a.m. on Saturday morning in Pershing Square for celebrity speakers and performances followed by a march at 10 a.m. On the same day in D.C., marchers can meet at 11 a.m. at the Reflecting Pool at the base of the Lincoln Memorial. New York City will host a pre-march rally at 11:30 a.m. at Central Park West and 61st Street, and the march will begin at 12:30 p.m. from Central Park West and 72nd Street to Sixth Avenue, ending at 43rd Street. Along with marchers, celebrities, and politicians, many brands are getting involved with the activism. For instance, the chic accessories brand Clare V. released a "Vive la Resistance" bandana in honor of the Women's March as part of the CV Vive la Resistance collection. "We first designed the Vive sweatshirt in response to the general malaise we were all feeling in the U.S. in the beginning of 2017. We decided to reissue the print in the scarf when Sarah Sophie Flicker informed me that she and the other founders of the march were publishing a book called Together We Rise—and we wanted to do another product to give back," says founder Clare Vivier. A percentage of the proceeds from the bandana will go toward the Women's March and a portion of the proceeds from the other Vive la Resistance collection items go toward Planned Parenthood. Gather your posse and paint a sign; it's time to march. Head to the Women's March website for details about your city's demonstrations and other ways to make your voice heard.